The cables are designed to continue working in the event of a fire condition, and an ideal choice for powering fire suppression and emergency evacuation equipment such as smoke fan, fire doors, and sprinkler systems. 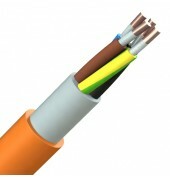 These cables meet the requirements of IEC 60331 standard to provide circuit integrity at 750oC for 3 hours. Generally used in hospitals, tunnels and public buildings. Plain copper conductors to IEC 60228, Mica Glass Tape as fire barrier, XLPE insulation, LSZH filler, LSZH sheath (orange).